A few months ago, I eagerly started a series of review posts on James W. Thompson’s new book The Church According to Paul (Baker, 2014), but (alas) I could not keep up with posting during the holidays. So, in lieu of several posts, I am just going to touch upon what I think is one of the best contributions of his new work. In ch. 6 (“‘Missional’ May Not Mean What You Think”), Thompson addresses the question regarding whether or not Paul taught his churches to evangelize. While Paul does not mention teaching evangelism in his letters, some scholars have tried to make the case that he would have instructed believers about this. Thompson does a good job surveying the scholarship on this issue and recognizes the meagre amount of textual material in Paul that might address this issue. In the end, he takes a kind of via media approach, acknowledging that Paul does not seem to teach “evangelism” in the way we think about today, and yet he also would not have presumed that sharing the gospel was merely the work of apostles and missionaries. 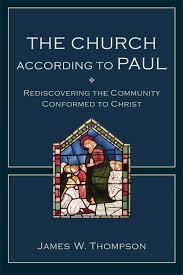 Thompson encourages us to read Paul carefully, particularly how Paul understands the nature and mission of the church: “The assembly offered one of the most important means for evangelism” (169). Paul assumed that unbelievers would be invited to the gathering and learn the gospel from the inside, as it were. Thompson reminds us that we cannot wring out the biblical text in order to squeeze out the whole set of practices of the church we should have for today in their fullness. The first century was a time of great fluidity for early Christianity – while the church was “on the rise,” it was still quite small and, thus, operated in a less systematic fashion. Yet, what the apostles taught and did certainly point us in the right directions. Please humor a personal set of observations. I am all for outreaching evangelism, gospel-ing in the marketplace. But something Thompson writes here really resonates with me. I live in one of the most post-Christian environments in the US, and I can see the time of big-box megachurches coming to an end, because they are all but gone here. The bright lights and big shows are simply not giving life. They may have had their day filling seats, but they have not been enough to fill hearts. What Thompson is talking about here is irresistible life in community – dependence, love, generosity, sacrifice, hope. It always puzzled me that Jesus said “By this everyone will know that you are my disciples, if you love one another” (John 13:35). Why “one another” – why not “everyone”? Well, in that time, friendship really meant something, and you didn’t have 1000 friends on Facebook, most of whom are acquaintances. People had a hard enough time loving family and close friends, how much more everybody else? The world, I think, would watch if the churches did something radically different than culture – if they really learned to love each other like Jesus. They would come and see. They would run. I really like your comments, Nijay. The comments by Nijay Gupta at the bottom are really good. Excellent insights by Nijay Gupta! A helpful summary, Nijay, and I especially appreciated your “prophetic word” at the end. Thanks, Brian. Miss you, friend. Hope you are well.